Diwali is just around the corner and me busy preparing goodies especially sweets [family being fan of sweets]. Soyi Khadi is the simplest sweet that I can think of preparing, for any joyous occasion or festive celebrations and it always remains on my list especially during Diwali ... If you are interested to know the recipe for this sweet, I have posted one which you can check here. This time it was coconut sweet with a twist, yes the khadi was prepared but in different shape and made rich with inviting flavors. I have tasted sweets/desserts with mango flavors, but have you ever tried tasting sweets with Kewra essence? Read more about Kewra here. I was not sure about how it would and that's how I decided to experiment and taste it. Added it in place of cardamom powder. 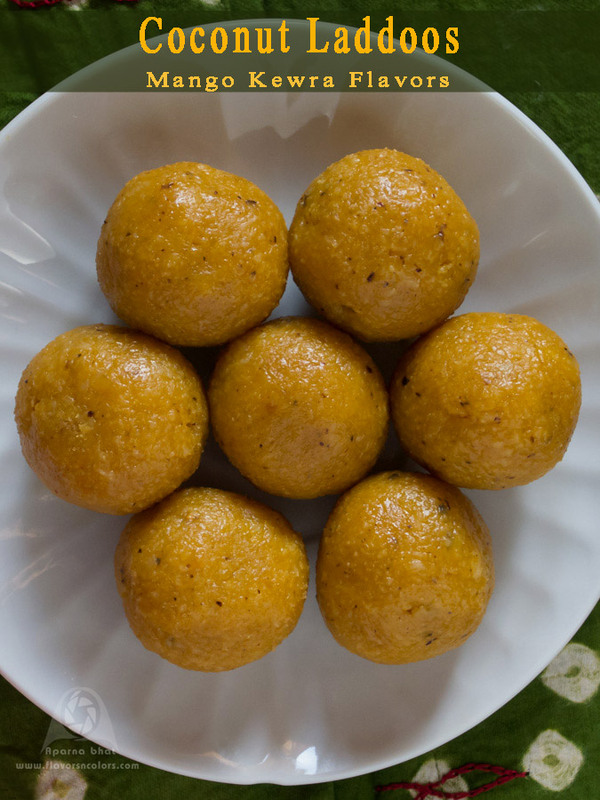 Melt in mouth, juicy soft coconut laddoos with subtle mango flavors and hint of kewra essence added unique flavor taking this sweet to next level . 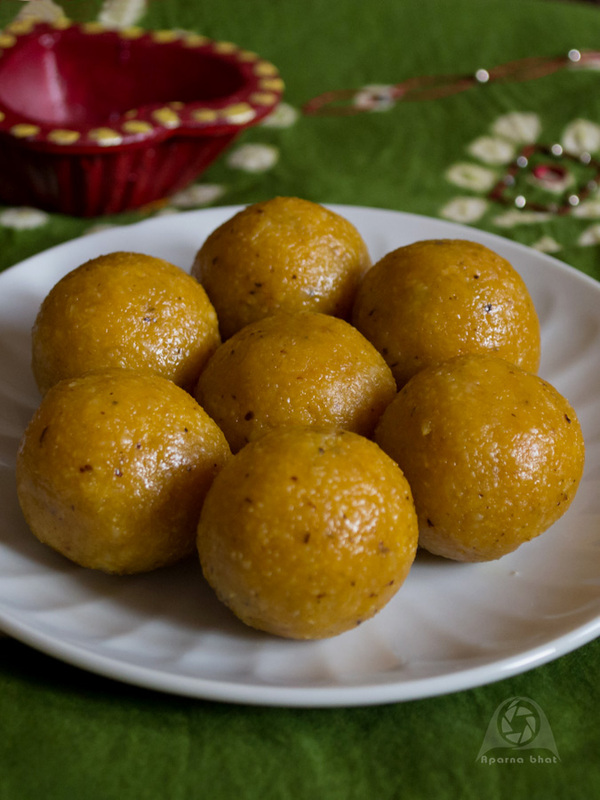 You wouldn't want to stop eating on one, such are these laddoos ~ an exotic treat to your tastebuds! Happy to share with you all the its recipe here. Heat a non stick pan. Pour milk and add cream. Allow the milk to boil and reduce its flame. Add shredded coconut and stir it nicely. Continue cooking the mixture, stirring occasionally until the milk has been absorbed by the coconut. Now add sugar and mango puree. The sugar will start melting and once again the mixture turns watery. Stir it continuously and cook the mixture until all the moisture gets absorbed. When the mixture starts leaving the sides of the pan, switch off the flame and allow it to cool down until you can handle the mixture to make round balls. Since I have kitchen weighing scale measured each portion to 25 gms and rolled each between palms to round laddoos. You may adjust the portion and make it small or large size laddoos. Store the sweets in airtight container and refrigerate them. Happy cooking and Happy Diwali to all friends here. Coconut and mango! Yes please!!!! This sounds amazing. I wonder if I could use a coconut cream in place of dairy cream?